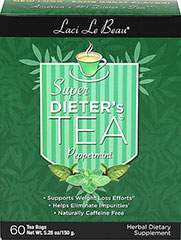 Laci Le Beau Super Dieter’s Tea can be satisfying, especially with the help of this flavorful, all natural Super Dieter’s Tea in Peppermint. The finest botanicals are carefully blended together with an inspiring aroma to lift your spirits. This Peppermint herbal tea combines tangy orange and sweet papaya, so good you will want to sip all day long!